A gruesome video shows a podiatrist chipping away at a build-up of cracked skin on the bottom of a patient’s foot. Marion Yau, who names herself ‘Miss Foot Fixer’ on YouTube, said she loves treating hard skin and cracked heels. Working at London’s Harley Street Foot and Nail Clinic, she gently scraped away at an unnamed female patient’s feet with tools for an hour. However, after seeing Miss Foot Fixer, she said she would never return for a pedicure because ‘you don’t know how well’ they clean the tools and foot baths. Then she works on the deep heel cracks with a gauge blade, followed by filing the balls of the feet to get the ‘superficial hard skin’. At this point, the woman starts to laugh – presumably because she had regained the sensation she lost due to the the thick skin. Lastly, Miss Foot Fixer drills at the deep heel cracks – called fissures – with a machine tool. Viewers commented that a lot of ‘professionals’ can leave the foot looking ‘butchered’. 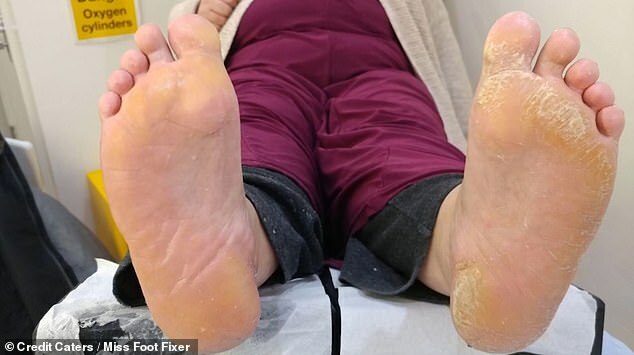 Dr Anton Alexandroff, consultant dermatologist and British Skin Foundation spokesperson, said: ‘The patient is likely to have dermatitis or psoriasis of her feet. He said: ‘The practitioner is removing thick skin but the patient needs to see a specialist dermatologist to treat the underlying condition. Cracked heels, also called ‘heel fissures,’ are a fairly common foot condition.